I couldn’t keep my eyes open. I was sitting against a fence, shivering, my calves tied into knots and my hip flexors threatening to burst into flames, and all I wanted to do was sleep. I’d force my eyes open, take a sip from the water bottle I’d been handed after I crossed the finish line, and then my eyes would slide shut again. Open, sip, repeat. At one point, a concerned medic approached me. “Everything OK?” he asked. I forced a smile, told him I was fine, just needed to rest, and then I gave in. I shut my eyes once more and drifted off, maybe for 30 seconds, maybe for 10 minutes. 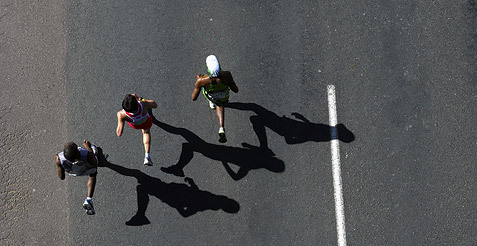 I’d never been overwhelmed by the urge to sleep after a race, but I’d also never run a full marathon. I finished (just barely) the Chicago Marathon in October, but as I sat against that fence in the chute for the Arizona Rock ‘n’ Roll Marathon, I could finally say that I had run a marathon. Well, once I woke up, I could say it. The 3 hours and 44 minutes I spent running through Phoenix, Scottsdale and Tempe epitomized that paragraph. 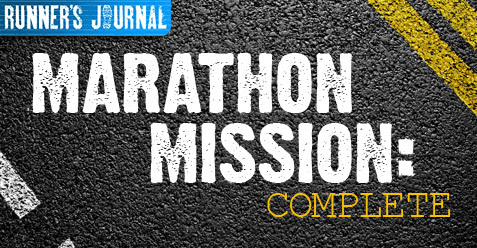 It was most definitely a challenge to accomplish my goal of running a full marathon. I blew past my limits and bulldozed my comfort zone during the race, and did my best to ignore “that voice” for the final six miles or so. I set out to run the whole race, and save for a handful of quick pit stops to guzzle some water or Gatorade, I did just that, even when “that voice” was pleading for a break at mile 24. I kept my feet moving, refused to walk, and crossed the finish line almost an hour faster than I did in Chicago last October. Then I took a nap. I won’t pretend that I accomplished anything monumentally profound last weekend. 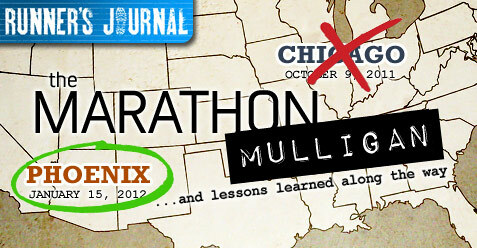 Heck, it seems everyone is running marathons and half marathons these days. But it was a significant personal achievement, a moment I won’t ever forget, a moment I once thought would never happen, and yet there I was in the chute, medal in hand, mission accomplished. I was sleeping, but I was there. “I run to find my limits and expand them.” In hindsight, this line is perhaps the most accurate in the above paragraph. I remember how awful I felt after finishing my first half marathon, and how fantastic I felt seven months later after my third. My body wasn’t ready for 13.1 miles in Columbus, but by Cleveland, it knew what to expect and I cruised to a PR. Last Sunday, my body was toast. I crossed the line sore, nauseous, thirsty and exhausted, certain I couldn’t have run another 10 feet. 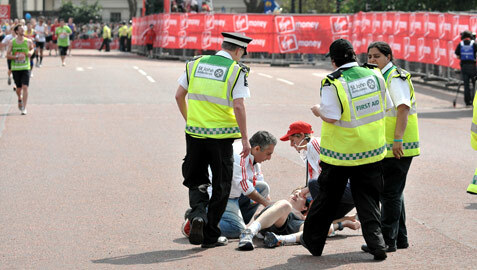 That’s exactly how I felt after my first half marathon. Now, a 13-mile run qualifies as an easy day. Will the pattern hold next month when I hop onto a plane to run the Tokyo Marathon? To be clear, I’m not suggesting Tokyo will be easy just because I finished the Arizona Marathon, but it should be easier. Not only will my body be better conditioned to handle 26.2 miles, but perhaps more importantly, I now know that I can, in fact, run a full marathon. Clearing that mental hurdle is huge. Telling yourself you can do something is one thing, but proving to yourself that you can do it is another. At the expo the day before the race, I bought a shirt that said “Inspired to Run” on the back. Those three words sum things up beautifully for me. The act of running – of hitting the pavement or treadmill several times a week, braving the elements in the dead of winter or peak of summer, logging mile after mile after mile on lonely roads and rolling trails – isn’t a whole lot of fun. It’s not easy either. But it’s damn sure rewarding. I’ve accomplished things during these two years of running that I never thought were possible. In about five weeks, I’ll add one more item to the list when I run a marathon in Tokyo. That’s incredible to me. And it’s no coincidence that, with each mental hurdle I’ve cleared in my training, my confidence in other areas of life has soared as well, driving me to pursue other personal and professional endeavors that once seemed out of reach and unattainable. That may sound corny, but it’s the truth. 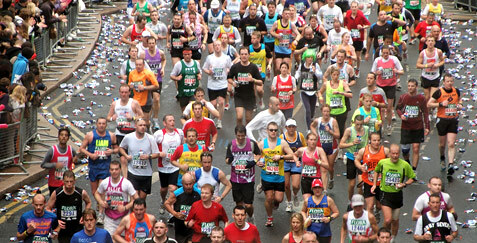 There’s a reason running has exploded in popularity over the last decade. 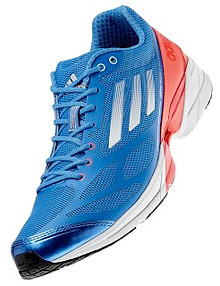 There’s a reason I have friends and family members emailing me for beginner training tips or advice on picking their first pair of running shoes (I’m no expert on either subject, by the way). There’s a reason people like my aunt, who ran her first marathon last year at the age of 53, fall in love with the sport. She’s done a bunch of half marathons, some sprint triathlons, joined a team for Ragnar last year, and probably accomplished so many other things that I don’t even know about. She also completed her second marathon in Arizona last weekend, and was thrilled to PR by about three minutes. That’s what it’s all about. I am a marathoner. I had to wait three months longer than anticipated to be able to say that, but it doesn’t make it any less sweet. I can’t relax yet, though, not with the Tokyo Marathon on the horizon. I’m not sure how I’ll feel when I pick my routine back up Sunday with an easy five miler, but there’s only one way to find out. It’s no secret that you need plenty of water before and after a run, but what about during? 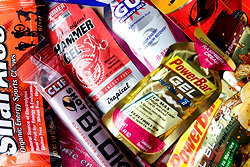 And while most runners know all about carbo-loading with a big plate of pasta the night before a race, trying to figure out whether you need GU energy gels (pronounced “Goo”) or some other form of in-race nutrition to keep you chugging through the finish line can lead to some tricky trial-and-error experimentation during your training. To GU or not to GU? That is the question. I’ve put in a fair number of miles over the years, but prior to competing in my first half marathon, the farthest I’d ever run was 11 miles. In fact, during my heaviest volume days in high school, most training runs topped out around six miles and races were anywhere from a half mile to a 5K, or 3.1 miles. Because of that, I never had to worry about in-race hydration and nutrition – by eating well the night before and taking in plenty of fluids prior to a race, my body was prepared for the moderate mileage it had grown accustomed to. Running 26.2 miles? Well, that’s a different story. I first started looking into energy gels while training for the half last year. 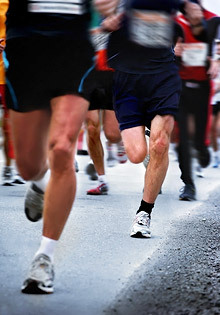 Also referred to as endurance or sports gels, these single-serving plastic packets of goopy carbohydrates typically contain some form of simple sugars like sucrose or fructose, and supply the body with calories and nutrients to help delay muscle fatigue while raising blood sugar levels and enhancing performance. 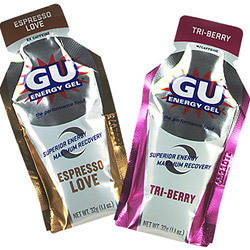 The first and perhaps the most popular energy gel – the one you’ll likely see in sporting goods stores or during most longer races – is the previously mentioned GU. I didn’t know if I would need energy gel during the race, but since this would be my longest run ever, I figured I at least should consider it. The first thing I learned was that I needed a test run. Literally. No matter the brand, energy gels in general can cause gastrointestinal discomfort for some runners – most commonly cramping, bloating and/or diarrhea – so you’ll want to introduce them to your system during a long training run instead of a race setting, just to see how your body reacts. I picked up a berry-flavored GU on the way to my final 10 miler and planned to take it about six miles in. Unfortunately, I didn’t notice the note on the package about taking the gel with some water. I tore off the top of the packet and squeezed the thick, sticky, berry-flavored gel into my mouth. Instant cottonmouth. It was like trying to swallow the world’s thickest, sweetest cough syrup. A mile or so later, I felt slightly and briefly nauseous, but it was smooth sailing once that passed as I finished the final three miles strong despite my sticky lips and dry mouth. However, while my stomach handled the gel fine during the run, I had some problems afterwards and elected to pass on GU during the race a couple weeks later. Two months after that, I had some stomach issues during another half marathon. In hindsight, several factors likely contributed to the problem, but my main suspect at the time was the GU I took at mile 7. I didn’t run very well in general that day so the GU may not have been to blame, but I certainly didn’t feel any better at the end of that race than I felt without any gel at the end of my first half. Frustrated and disappointed after my poor finish, I swore off energy gels for good. Then I signed up for the Chicago Marathon. All runners are different, and all runners have different needs. Some have to stop at every water station to stay hydrated and healthy, while others blow through the stations without taking a drop. I’d always been in the second group, but I’ve also never run for three or four hours straight. One day, it dawned on me: I am going to need some kind of nutrition for the marathon. GU again? Well, I recently gave GU another try but after mixed results, I turned to apple-cinnamon flavored Hammer Gel for a 14-mile training run last weekend. The Hammer Gel, which contains real fruit juice and no added simple sugars, wasn’t nearly as thick or sweet, making it much easier to swallow while cutting down on the cottonmouth, and it tasted pretty good to boot. I took a few sips of water from one of the bottles in my new hydration belt (more on that below) and, after another slight but brief bout of queasiness, I finished the second half of my run rather well. Once it was clear later that day that my stomach had no problem with the Hammer Gel, I had officially found my in-race nutrition. There are, of course, dozens of other options available to the running public, from Clif Shots and Accel Gel to PowerBar Gel and Carb Boom. You can also try chewable products like GU Chomps, Clif Shot Bloks, Sport Beans and even regular ol’ gummy bears. I’ve had Sport Beans and GU Chomps, but only before runs because I find that chewing while I’m running disrupts my breathing and rhythm. Some runners use Honey Stinger gel or simply grab single-serve packets of honey for their long runs, while others create their own homemade portable energy sources (a quick Google search will yield plenty of options for you DIYers). 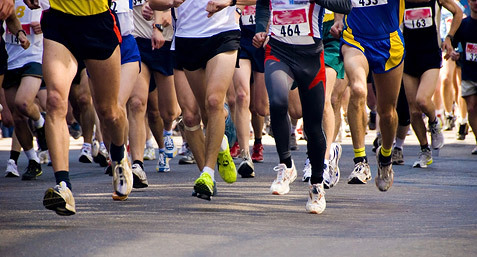 Most casual runners probably don’t need to consider energy gels or other forms of nutrition– they’re typically recommended for people running for 45 minutes or longer – but if you’re thinking about signing up for a big race (think 10K, half marathon or more), you probably will have to spend some time experimenting like I have to find a nutrition option that works for you, and don’t be afraid of a little homework. Different runners prefer different products – I have friends who swear by GU, some who love the Sport Beans and others who don’t like any of them. The web is littered with comparisons of these products, tips on how to take them, and a host of other issues you should consider while doing your research. Hydration, on the other hand, is a little simpler. 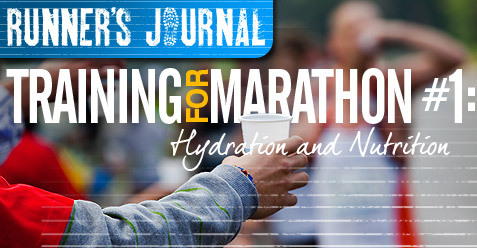 Every runner needs fluids, some just more frequently and in greater quantities than others. I don’t like holding anything when I run so water bottles aren’t an option, and I’ve never been particularly adept at drinking from the little cups they hand out at water stations – I usually end up spilling 97% down the front of my shirt and another 2% dribbles down my chin, allowing the remaining 1% to actually reach its intended destination. For those who choose to walk intermittently during a race, however, the stations are a perfect place to take a breather, rehydrate and maybe wash down some energy gel. If, like me, you need an on-the-go solution to your hydration needs, there are plenty of options. You could go with a handheld water bottle for shorter runs, but that seems like the least effective option. I recently bought a Nathan Speed Waistpack with two 10oz bottles, knowing I’d need some help getting through my upcoming 16-, 18- and 20-mile training runs. I admit that it took a bit of time getting used to those two bottles sloshing around on my waist, but by my second long run, I barely noticed them. And when it came time to take my Hammer Gel, I had the water I needed to wash it all down. It may look and feel a little goofy at first, but if it gets the job done, who cares? 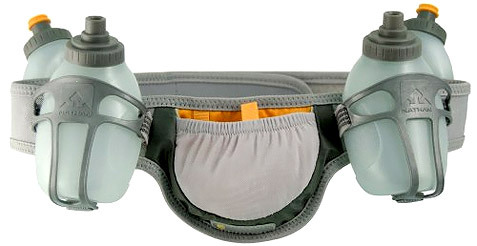 There are an endless number of hydration belt choices out there with all sorts of various factors to consider, including comfort of fit, number of bottles and waist size. If you need more water than a hydration belt offers, consider one of the Camelbak Hydration backpacks. I’ve never used one but have seen plenty of other runners with them, and customer feedback on sites like Amazon is overwhelmingly positive. An added bonus is the ability to stash essentials like keys, wallet and/or phone in your Camelbak. 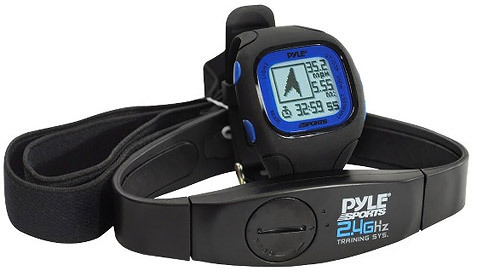 My recommendation would be to try on several of these packs and belts at your nearest running or sporting goods store to see how they feel, but you won’t know what works for you until you hit the road with one strapped to your hips or back. So what about pre-race hydration and nutrition? Well, that’s a much bigger can of worms. I drink plenty of water and some Gatorade before a run, and will also have some coconut water between runs to help keep me hydrated consistently. On the morning of a race, I add Gatorade Prime to the water and standard Gatorade regimen. Food, of course, is much trickier and, like so many other factors, varies wildly from runner to runner. I recommend doing your own research on this subject and, as always, experimenting to find what works for you and what doesn’t because, as you’ll discover when you start increasing the length of your races and training runs, your needs are going to change along with the mileage. What worked for you on a two-mile jog or 5K race probably won’t be enough for a 10K or half marathon. And, I think it goes without saying, what works for a half marathon most certainly won’t work for a full. Bullz-Eye.com editor in chief Jamey Codding ran competitively in high school, took a brief 15-year breather, and then came back to run his first half marathon last year. He’s currently training for his first full marathon, in Chicago on October 9. Only 44 days to go…but who’s counting, right? !